Please note this is an economic debate, not an ethical one. The usual mudslinging and abuse from both sides occurred. One of the posts from the non hunters, was that all hunters were psychopaths. I’m not sure that Teddy Roosevelt, Frederick Courtney Selous, James Corbett, Ernest Hemingway, James Stevenson-Hamilton and Harry Kirkman amongst others would agree with you. In England a bunch of people including royalty, get on some horses and with a pack of hounds, chase a fox until it is exhausted. Outnumbered by 12:1, the fox is eventually ripped to pieces by the hounds. Are the people involved in the hunt all psychopaths? In Spain a large group of people gather in an arena to watch a matador taunt a bull and then kill it with a spear (occasionally the bull kills the matador). 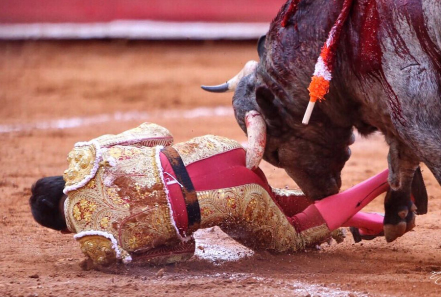 As the blood flows and the unfortunate bull crumbles to his knees, the King of Spain sips his best Spanish wine from the comfort of his royal box. Are they all psychopaths? Hunting, fox hunting and bull fights have a number of things in common. Firstly, great cruelty and secondly, enjoyment by human beings at the death of a fellow creature. But this newsletter is not about the ethics, but rather the economics of hunting. The Timbavati have spent millions of rands on improving their land, fencing their land and protecting their animals. The Timbavati record of protecting their rhino is one of the best around. Therefore their attitude is, if we have spent millions of rands protecting our land and animals, we would like a return on our money. The Timbavati can either photograph, catch or hunt their animals. Because of foot and mouth disease, only non cloven hoofed animals can be sold. This leaves Timbavati with hunting or photography. Hunting and photographic safaris are not compatible. However, Timbavati seem to have come up with a formulae whereby they are doing both. Good luck to them. They are cleverer than I am. The hunting outfitter’s argument is that one hunter from overseas impacts the land for a few days, creates a few jobs for trackers and skinners, pays the Timbavati R13 million, which they can use for their good conservation work. The hunting outfitter’s argument is: How many game drives burning fossil fuels need to be done to earn R13 million? How many Coke cans and consumer garbage from the tourists to earn R13 million? How much noise pollution from aeroplanes bringing tourists to the lodges to generate R13 million? How many toilets will be flushed at 5 litres of water a flush? The protectionists will argue that the hunter creates very few jobs and the meat from the bull elephant will never reach the local communities. In fact the protectionists will argue the local community will not benefit at all from the death of the bull elephant. Most private game lodges work on a ratio higher than 1 guest to 3 staff, i.e. a 50 bed game lodge employs more than 150 people. The protectionists will argue that in order for wild life to survive, the local communities must taste the benefits of the wild life. This is done through job creation and eco tourism. Under the protectionist scenario, the bull elephant should remain alive, because being a hundred pound tusker, he is a huge tourist attraction and therefore a renewable resource. In the big tusker debate, a discussion broke out between two posters. The one said human men like Elephant bulls over 50 years of age are no good for breeding. The famous tracker Winnis Mathebula, was still producing children with his young wife at the age of 70. My Kenyan tracker Lakakin Sukuli at 40 years of age, took a 14 year old wife. One of Lakakin's reasons was that when he was 60 years old, his wife would be 34 and would still be able to produce children. According to Lakakin many Masai men in their 70’s are still producing children. Why don’t all you female activists get a sample of men over 50 and test their virility and their fertility. I offer myself as a sample, but how you get my sperm must be negotiated. I am tracking a young tigress through rugged terrain. The rock I am standing on rolls from under my feet. I have a high centre of gravity, my weight is distributed downwards on two legs. The result is I fall heavily on the rocks. The tigress is moving over the same rocks. The rock rolls from under her paws. Her weight is distributed over 4 legs, she has a low centre of gravity. As the rock rolls, she simply jumps to the next rock. As she jumps, her tail is stretched out rigid to counter balance her. As she lands, her paws expand 30% and the digit pads mould around the rock upon which she is landing. Her weight is distributed across all 4 legs. Having picked myself up from my fall (the tigress has heard the fall from 500m away), I follow the tigress tracks into a dense thorn thicket. The thorns catch my clothes, retarding my progress, vines trip me up. The tigress hears me pursuing her. The tigress low to the ground, slips under the bush. The thorns comb through her silky coat. She moves silently on four leather padded paws. The tigress is moving at 5km an hour, clearly I will not catch up to this tigress. I stop to rest and get to thinking. Did our brain begin developing when we were moving around on all fours or did our brain develop after we became an erect species, moving on two legs. Once we were moving on two legs, there were certain advantages. We could see the prey over the grass. Our hands were free to use weapons. The disadvantages were, we could be easily seen by the prey. Secondly, we were flat footed so acceleration was difficult (a tiger’s weight is thrown forward as it moves and it can therefore accelerate swiftly if prey jumps up in front of them). Thirdly, as an upright species, our centre of gravity is high and we fall easily. Once our brain developed, we moved from primitive weapons to bows and arrows, to rifles, to automatic rifles, to nuclear weapons. Did our brain enlarge when we were a species moving around on all fours or did we became an upright walking animal and then our brain enlarged? It is with regret that I have to inform you that the Tigress Oksana has been destroyed. Under pressure from the male tiger, Corbett, Oksana burrowed under a gabion and under the electrical fence. Oksana must have been under enormous pressure as large rocks were removed as she burrowed out. I pursued her for 34 days across 6 different properties. I estimate that she covered 150 km during this time. A helicopter was called 4 times, but Oksana refused to budge from the thick bush, even when the helicopter went low level. Five times she came to the entrance of the baited drop door cage, but she never entered. I tried playing distress calls of prey animals, but she never responded. A night vision infra red camera was purchased. Gavin Rous, the vet came 3 times, but never fired a single dart. During the search, Oksana made 9 warthog kills (I’m sure there were more), 2 porcupine kills, one mountain reedbuck and a mountain zebra. When she died, her chest was covered in porcupine quils. On the journey, Oksana revealed water holes and fountains that I never knew existed. She took me through some of the most spectacular landscapes I have ever walked in. Over 2 000 man hours were used in the search. Construction of the lodge was delayed for 10 days as construction crews refused to work through fear of the escaped tigress. Oksana was just 28 months old and at dispersal age. Her death is a major setback for Tiger Canyons and for me a deep personal loss. Trackers: Jacob Pieterse, Jacob 2, Sylvester, Herold Mogane, Dial Pieterse and Joseph Pieterse. Rodney and Lorna Drew, Emma Wypkema, Ben, Keisha Kleinhans, Thinus Steyn, JJ van Zyl, PD Jacobs, Jan Kruizenga, Piet, Tian, Abel Erasmus. I would especially like to thank Wimpie Geyer of the Free State Nature Conservation for all the support given during the search.